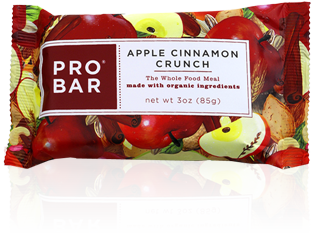 I scored a few free bars from ProBar, such as the Sweet & Savory Maple Pecan Bar, and the Apple Cinnamon Crunch bar. 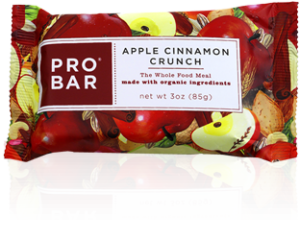 I was hungry the other day, and in the mood to try something new, so I opened up the Apple Cinnamon Crunch bar to give it a try. I was sure I was going to like it- I love apples & cinnamon! A quick few things about these bars, they are vegan, organic, and I found out online that this one is “70% Raw” and also has “Omega 3: 650 mg per bar” and “Omega 6: 720 mg per bar”. I thought that was pretty cool, a lot going on this bar! I opened up the package was greeted to a rather thick bar, brownish in color, with visible chocolate chips scattered throughout. Examining closely I also saw a good deal of flax seeds and an occasional nut. I took a bite, and found it to be chewy and very soft, except the for the nuts providing an little bit of crunch. It was pretty apple-y in flavor, which I liked, and really quite tasty!! The apple flavor kind of reminded me of apple pie, with just a very light cinnamon aftertaste. 1 bar is 370 calories, 18 grams of fat (4 saturated), 49 grams of carbohydrates, 8 grams of fiber, 25 grams of sugar and 9 grams of protein. Since this one reminded me of apple pie, what’s YOUR favorite flavor of pie? I think I’d have to say, mine really is apple! This was called a “Whole Food Meal Replacement”, along with being vegan and organic. Knowing that it was a “Whole Food Meal Replacement” bar made sense after looking at the nutrition. This bar, which is bigger than most bars I have eaten, but not incredibly large (85 grams), was 390 calories, 23 grams of fat, 43 grams of carbohydrates, 7 grams of fiber, 17 grams of sugar and 10 grams of protein. So I certainly wouldn’t call this a snack. Although a little low in the protein department in my opinion for a “meal” it was overall pretty good. But how did it taste? Well, the first thing I noticed was it was a brownish colored bar with several things, such as chocolate chips, pecan pieces, raisins, some flaxseeds I believe, and a bunch of other things all mushed together. It was rather sticky and chewy, but with some crunchy consistency from all the pieces of things in there. The flavor was quite bizarre, actually. 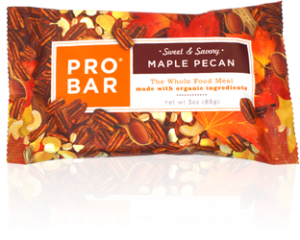 I didn’t quite pick up a “maple pecan” flavor, but more of a sweet, fruity tasting bar, with maple-orangey flavor, with a toasted nut taste, and just a teeny bit salty. I know, a lot going on. I would have preferred a bit more of a salty flavor, but that’s just me. The raisins were plump and pretty good, and the pieces of nuts were OK, if found them to have a kind of off flavor. One of the things I really did not like was the chocolate chips. I looked at the ingredients and saw “unsweetened dark chocolate”. Now, I’m not a fan of dark chocolate to begin with as I find it kind of bitter, but especially when it’s not sweetened, I found it extremely bitter. In other words, I would have totally been fine with this bar had it not been for the chocolate chips. So, summing it all up, I think these bars are convenient for when times when I’m on the go and don’t have time for a sit-down meal. 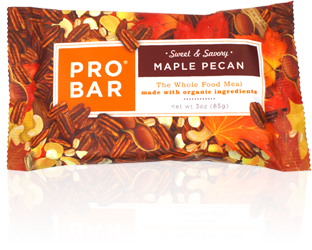 The fact that it has a high fat content I think makes up for the low protein content as fat from nuts and such helps me stay satisfied. If the chocolate chips were omitted or swapped for something else, I would have liked it much more. Otherwise, this gets 3 stars. Question- What do you eat when you dont have time for a “sit down meal” on the go?